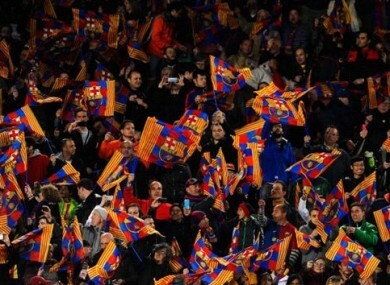 The Catalan club and their fans have been reported by Spain’s Football League authority. Barcelona fans have been punished for their abuse of Ronaldo. BARCELONA AND THEIR supporters face punishment after they were reported on Tuesday for repeated derogatory chants against Real Madrid forward Cristiano Ronaldo during Sunday’s 5-0 win over Levante at Camp Nou. According to a report compiled by Spain’s Professional Football League authority (LFP), supporters in the south stand at Camp Nou repeatedly chanted “He is a drunk, Cristiano is a drunk!” in the 65th minute of the game, in reference to the Portuguese’s controversial celebration of his 30th birthday the previous Saturday in Madrid. “A group of approximately 200 people identified with scarves, banners and flags from supporters’ groups of the local club and in particular, the group known as ALMOGAVERS, located behind the banner identifying that group, started singing the following song: “He is a drunk, Cristiano is a drunk!,” the LFP revealed in a statement on their website, adding that the chant was carried out “repeatedly” and “exclusively” by those fans while others were well-behaved. The details of the report, which also cites abusive chanting in the Sevilla-Cordoba and Albacete-Betis clashes, have been passed on to Anti-violence and Competition Committees, which could choose to fine both Barca and the fans in question for their behaviour on Sunday. Ronaldo has long insisted he does not drink alcohol, but was pictured looking worse for wear at his birthday party on 7 February, just hours after Madrid had lost 4-0 to Atletico in a disappointing derby defeat at the Vicente Calderon. Email “Barcelona face punishment for 'Ronaldo is a drunk' chants”. Feedback on “Barcelona face punishment for 'Ronaldo is a drunk' chants”.